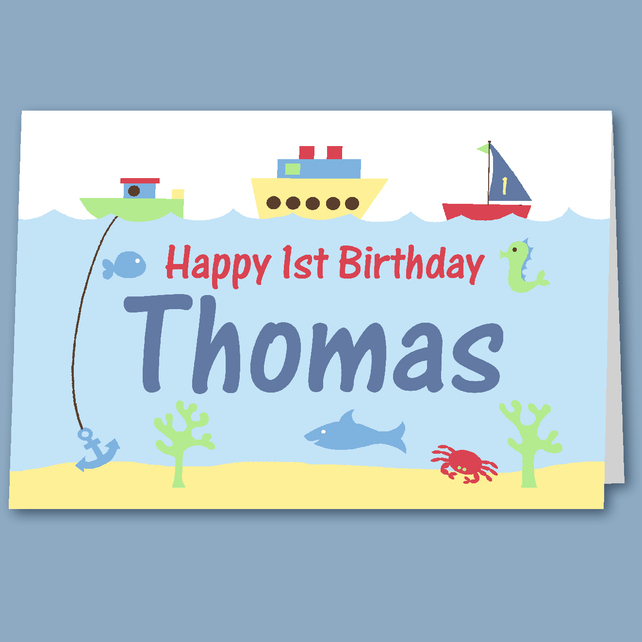 This lovely birthday card features the name of the recipient under the sea with boats bobbing around up above and cute sea creatures swimming around.! It is printed especially for you with any name and any age you require. Kids love to see their own name in print, and parents will appreciate receiving something so personal! Please just send me a message at the time of ordering, either here on Folksy or at the Paypal checkout, to let me know the name and age you require. It comes blank inside for your own message. The size of the card is 5 x 7 and its printed on 245gsm card. It comes with a plain white envelope and is wrapped in a protective cellophane sleeve.